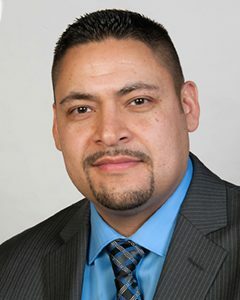 Home » Board of Commissioners » Jose G. Maldonado, Jr.
Jose Maldonado is a lifelong Chicago resident, having grown up in the Pilsen neighborhood. He attended Chicago Public School System’s Benito Juarez Community Academy and Maldonado’s drafting and design classes peaked his interest into the world of carpentry. Maldonado graduated high school in 1995 and continued his education at city colleges of Chicago’s West Side Technical Institute of Daley College where he earned certifications as an auto Computer-aided design and Computer aided manufacturing technician. In 2001 Maldonado was initiated into the United Brotherhood of Carpenters as an apprentice working extensively in residential, commercial and industrial construction. In 2006 he became a business representative for the Chicago Regional Council of Carpenters and in that same year started speaking to various Chicago Public High School students promoting the trade. In 2010 Maldonado was elected as financial secretary of Carpenters Local 54. He is also a delegate of the Chicago Regional Council of Carpenters and the Chicago Federation of Labor. Maldonado is fluent in English and Spanish.